SF45 Bravo is the second of a series of 4 training plans in this collection – Alpha, Charlie and Delta are the the other 3 plans in this series.All four plans can be purchased together in a packet, HERE. 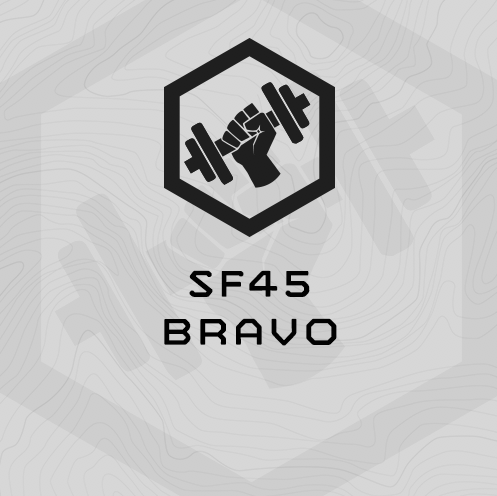 SF45 Bravo is a 7-week, 6 day/week training plan with an emphasis on endurance. Week 7 in the plan is an unload/re-assessment week. Parts (2) and (4) - you will get plenty of rest between rounds. You can either run or bike today, but whichever you chose, you must do the same (run/bike) for the rest of this training plan. If you chose to bike, do a brisk 10 minute warm up before the assessment. Run 1 mile at “Per Mile Interval Pace” based on your SESSION 2 3-Mile Run Time and the MTI Running Interval Calculator.